14:05 Introduction round (2min each person): Why am I interested in Commons Cargo Bike Sharing? Hannes and Florian of Kasimir Dein Lastenrad in Cologne introduced the concept of commons cargo bike sharing that is a fast growing movement of currently more than 80 independent local groups that are organized in the Forum Freie Lastenräder. Andrea of Cargobike Life in London, Norbert and his partner Kultaiset Pojat Oy from Helsinki and Hubert + Krzysztof, the leading cargo bike activists in Poland from Krakow and Warsaw want to check if/how the concept a commons cargo bike sharing could be used in their cities/countries. Susanne and Karl of the City Changer Cargo Bike project offered support for e.g. translating the German handbook on commons cargo bike sharing to help initiatives across Europe to establish their own projects. 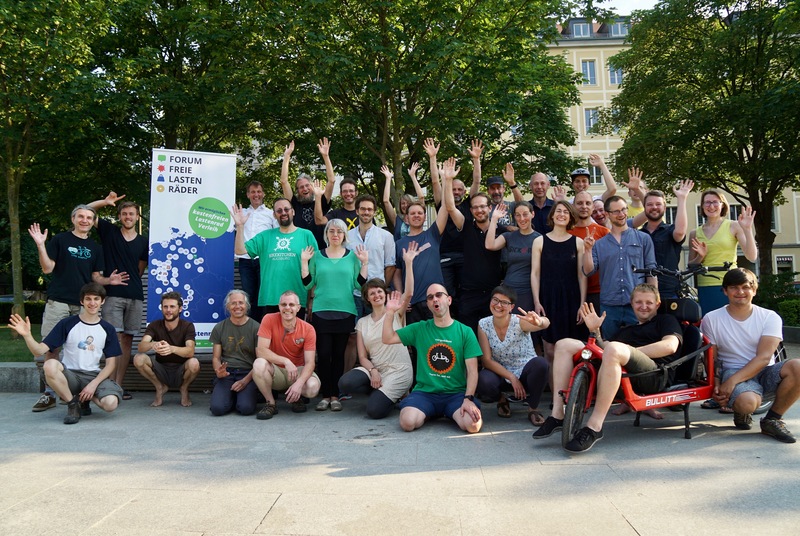 Forum Freie Lastenräder is working on a proposal for European knowledge sharing and collective learning to support establishing commons cargo bike sharing in different national contextes. Send us your ideas and get involved. Contact: international @dein-lastenrad.de. We will share the results in a own section in this wiki. Hannes Wöhrle (KASIMIR – Dein Lastenrad, Cologne/Germany): Running a commons cargo bike sharing since 2013. Glenn (Antwerp, Belgium): I have 3 cargo bikes: 2 ebullits with passive cooling rhino box and a urban arrow xxl with cargo box. And I am thinking about sharing them with my neighbours. Logan & Cargonomia Team (Budapest, Hungary): In 2015 we launched a community cargobike center and bike kitchen, in 2017/2018 with the help of the commons booking platform launched a public cargobike sharing system which currently includes 11 bikes, trailers and a few pet carriers. Andrea Casalotti, Cargobike Life, London. I am the importer of Christiania Bikes into the UK. Cargobike Life is a social enterprise I started with the owner of London Green Cycles (largest cargobike retailer in UK). Last year we were contracted by the City of London to conduct a feasibility study of a cargobike public hire scheme. We recommended a light version of the carvelo2go model; but the transport authority has sat on the report and not gone ahead (typical English). Florian Egermann, wielebenwir e.V. / KASIMIR, Cologne, Germany. Developer of CommonsBooking. Artist, Activist, Astronaut. Super excited for our talk! Hubert Mazur: I reside in Kraków, Poland, I'm lawyer and cargo-bike activist, member of "Kraków Miastem Rowerów" association, I cooperate with local authorities in Kraków, Gdynia, Słupsk and others in introducing pedel-powered solutions. I'm also the leader of local cargo-bike cooperative called "Pierwsza Spółdzielnia Rowerowa". I'm running site facebook.com/towarowe. Norbert Schmidt: During the past two years I have worked together with Gert-Jan Hendriks (Kultaiset Pojat Oy) on developing an electric folding bike subscription including maintenance and service to incentivise employers to promote cycling amongst their employees. We have carried out two trials in the Helsinki metropolitan area, Finland. Kultaiset Pojat is the Finnish importer for many different cargo bike and folding bike brands. We are now looking to trial cargo bike sharing as part of a publicly funded last mile mobility experimentation in Jätkäsaari, Helsinki.